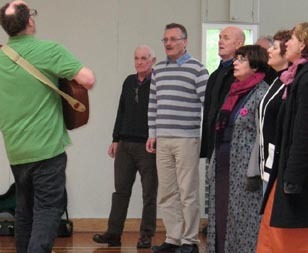 The gymnasium at Arohata Women's Prison was cold at first but it soon warmed up when 30 members of the Wellington Community Choir started singing to prisoners and Corrections staff. 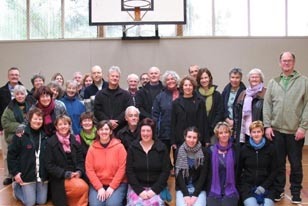 The choir sang a range of songs from cultures around the world, starting with waiata and then moving to the Pacific Islands, South Africa, Native America and African America. The prisoners were invited to join in and gradually, Julian started to teach them some new songs. “In an hour of music-making, we had some quite sophisticated things going on,” Julian says. “For most of the choir, it was their first time in a prison and some of them wondered if the women would participate. At the end of the performance, Arohata’s kapa haka group sang and performed for their visitors. Amy Blowers, Volunteer Co-ordinator, Wellington Area Prisons, says it was a “truly amazing experience” to see the women’s responses. “There are prisoners here who are highly creative and talented in the arts. They were thrilled to be included in singing with the choir," she says. "Their appreciation was obvious when they took to the floor to thank the choir for performing that morning. It's a day that won't be forgotten." The choir’s performance at Arohata Women’s Prison is an example of the Wellington community's compassion and generosity, Amy says. “We have a high number of volunteers active in our prisons, helping to motivate and support prisoners." Original generation time 1.5808 seconds. Cache Loaded in: 0.0004 seconds.